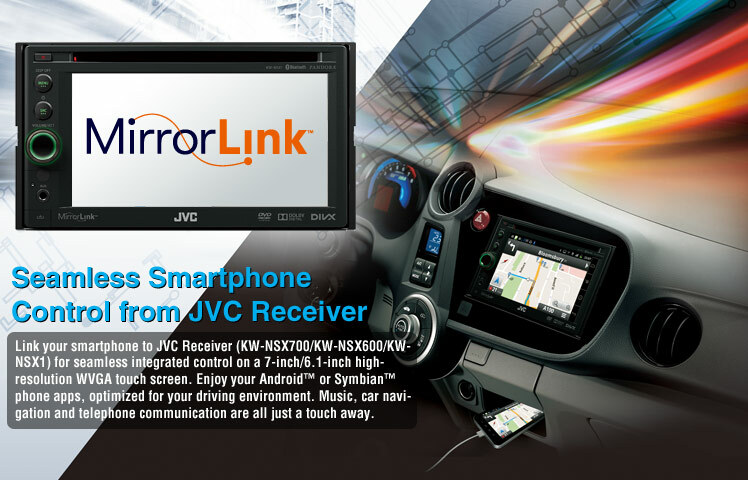 Smartphone integration is made possible by MirrorLink™*1 to allow totally synced operation with Samsung Android*2 and Nokia Symbian*2 phones, duplicating the phone’s screen on the head unit’s monitor. The user can take advantage of “Car Mode” to access apps that have been optimized for in-car use, thereby assuring a safe and comfortable driving experience. 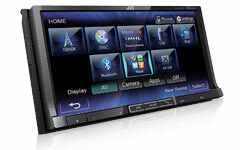 Car Mode provides a user-friendly gateway to access apps including apps for music playback, car navigation, and hands-free telephone communication. 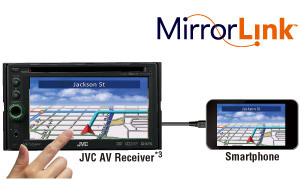 *1 MirrorLink™ and the MirrorLink Logo are certification marks of the Car Connectivity Consortium LLC. *2 Compatible Samsung and Nokia phone models, their launch timing, as well as Car Mode compatibility will differ by country or origin. 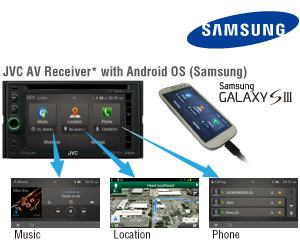 Samsung Car Mode application, “Drive Link”, can be downloaded from Samsung Apps. Once downloaded, individual apps are grouped into three categories for easy access — “Music”, “Location” and “Phone”. 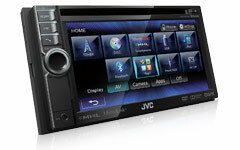 Selecting a category lets you quickly access specific apps for music playback, car navigation and maps, as well as hands-free telephone communication. 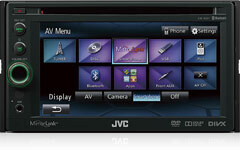 Through a close cooperation with Samsung Electronics, JVC AV Receiver* can offer optimized features dedicated for Samsung GALAXY S III smartphones, such as context awareness which displays next schedule and destination stored in the Samsung GALAXY S III. 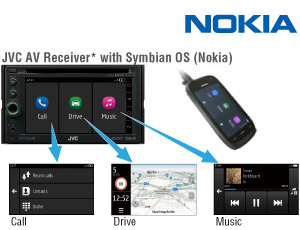 Nokia “Car Mode with MirrorLink” application is available at the Nokia Store and the screen is grouped into three categories for easy access — “Call”, “Drive”, and “Music”. Selecting a category lets you quickly access specific apps for music playback, car navigation and maps, as well as hands-free telephone communication.